A hat that can tip itself. A suitcase that turns into a bathtub. A pair of protective eyeglasses for chickens. These are just three of the hundreds of unusual inventions that people have dreamed up over the last two centuries. Some, such as the mustache guard, made perfect sense when they first appeared. Others were considered just plain silly. Jim Murphy has compiled a collection of the weirdest and wackiest inventions and presented them in a quiz style that is challenging and fun. Simple, clear explanations are provided on how the inventions worked or failed to work. 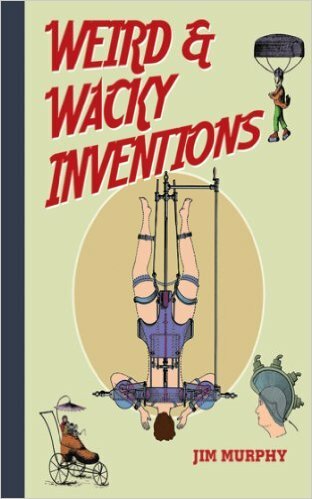 Complete with over 100 colored illustrations of these crazy creations, this is the perfect gift for any child interested in science and inventions. Ages: 9–12. Isa loved this book. We enjoyed reading the book as a family! I think Davey now wants to be a inventor! Jim Murphy began his career in children's books as an editor, but managed to escape to become a writer, entering a life of personal and creative happiness and enduring financial uncertainty. He's convinced that the latter keeps him coming back to his computer to write every day and feels that a sense of impending doom is the doorway to creativity. He has never counted the number of books he's published (feeling the time and energy is better spent doing research and writing) but guesses that he has over thirty books to his credit. Jim's work has been honored with numerous awards, including two American Llibrary Association Newbery Honor Book Awards, an ALA Robert F. Sibert Award and Sibert Honor Book Award, three National Council of Teachers of English Orbis Pictus Awards, a Boston Globe/Horn Book Award and a BG/HB Honor Book Award, two SCBWI Golden Kite Awards, and been a finalist for the National Book Award. Recently, he was given the ALA Margaret A. Edwards Award for "his significant and lasting contribution to young adult literature."